It’s hard to tell from this picture but he was in character…as he is often. He decided today that he would smear pancake syrup on both of his hands and perhaps his face for this character. He was the “Silver Surfer” from the Fantastic Four. When he tried to leave my kitchen obviously I started in with the mama hissy fit and wiped his hands and face. He had a meltdown. He was shouting and crying and I was about to shout, myself….as I am apt to do. In that moment though, here’s the thing, I decided to choose the good. You see I have these choices that I didn’t really see before. I had thought until, um, last week, that it was my JOB to be the killjoy. I had thought that imposing my iron will in my typical Bohemian Dictator style was just what the Dr. Phil ordered but alas, it’s never been a terribly good fit for us as a family. In taking a minute to pause and consider the “good” I realized that all I really needed to do just then was engage him…so I did. 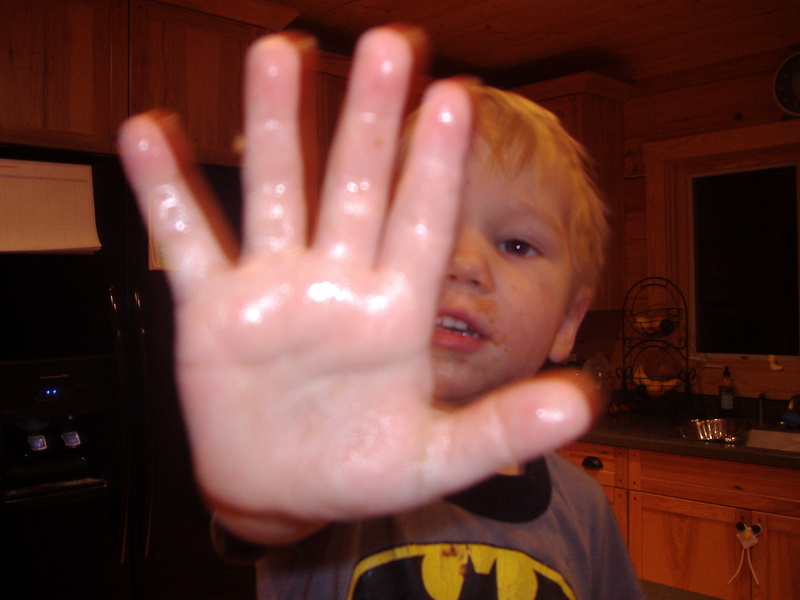 I put down whatever I was doing and first smeared his hands with syrup again to get us to the peace table. Then I sat down next to him and said, “So tell me about your life here, man…what do you need?” and he began to tell me the story of his “character” and why it was important for the character to have sticky hands. Truthfully, I still don’t get why he has to have sticky hands but that’s beside the point. The point is that he was calm (albeit sticky) and I was calm (and actually amused) and we were having a little moment right there. When we were done talking I said, “So, you know…you can do this in the kitchen but no sticky syrup hands anywhere else, right?” and he agreed. It took him about three minutes of playing and then he asked me to wash his hands and face off…so I did. And that was that. I’m generally of the belief in the childrearing part of my life that everything works once and for about 5 minutes at a time and then next time it’s like a totally different television show so I don’t delude myself into thinking that what I’ve got here is a magic bullet. What I do have here though is a really nice moment and I treasure those, I gather those up and hold them close in me. Hopefully that is like a little emotional vitamin to help fortify me for the next time. I need a lot of these but I’ll take them one at a time. This entry was posted in Cranky Mommy Chronicles, jocularity, Mid-life Crisis, Ordinary Time, Radical Thoughts, random musings by mrsmetaphor. Bookmark the permalink. She told us when we thought, “It’s just easier NOT to!”, we needed to ask ourselves if easier was the better choice. I think it relates to your lenten sacrifice. And I can confirm that doing things the hard way is ONE HECK of a sacrifice, so don’t ever tell yourself it’s not. It reminds me of those Love and Logic seminars I went to long ago on parenting. I am far from syrup hands, but the older the get the bigger the problems, the more talking you want to do but you end up listening a LOT. I do mean A LOT. Thanks for the post. I have decided to work soup kitchens with the family this lenten season, go to mass every week (we occassionally miss), and do stations of the cross with the kids. I have a station of the cross in mime that I wrote years ago that they might act out. Beautiful Mrs M. I am glad that you had the presence of mind to take a picture. Naomi, covered her body in lipstick awhile ago…and I never took a picture. I wish I would have. She was a beautiful plum color for DAYS…. It is so easy to miss those moments and with little ones they happen frequently. Some days I wake up praying that I will have insight like that with each of my kids….and respond to a given situation in just the way they need for that day. God is so Faithful….Thanks for sharing your story. It really is hard to choose the good…to re-focus and enjoy the moment. MrsM, this is the type of thing I always thought you were doing with your kids. Creative, no? I am so impressed with how you handled the situation by chilling out and setting some pretty fair rules for his creative play to protect your house and your time (syrup on the couch is near impossible to clean up!) and your son was able to grow from this situation instead of being stunted. Way to go! PPPJ… How are things in The Cat in the Hat Land? Things, get it? Thing #1 and Thing #2… LOL… I just love Dr. Seuss. I see you are linking to Obama’s site and wanted to give you a shout out — looks like it’ll be a big night! We’ll be popping popcorn with the kids to watch the results come in. Si, Se Puede!!! I like how you all seized on that idea, “engage, not enrage.” And MrsM it is really poetic and anthem-like. Too often parents match their kids’ tantrums with bigger ones of their own, and then how are kids supposed to learn appropriate behavior before they are let out into society? And for that matter there are just too many people out there demonstrating how monstrous tantrums can be when they grow up to become rage fits. If more people stopped to think and engaged in conversation instead of rage at ALL times, and especially with their own kids at home, the world would be such a better place. I think every parent has been in this place one time or another. Yesterday my dd came home with a volume of homework – this stresses her out beyond the beyond. Anyway we were coping with the homework, I have the flu so the patience level isn’t way up there at this point. She melted down and I looked at her and said “So where are we now with the homework, are you refusing to do it, or would you like to have a hug and talk about what is making you upset?” She crawled onto my lap, we snuggled and talked about the stress of it. Then we broke it down into little steps and I gave her a snack. We eventually made it through the homework which was great and we settled the meltdown. So I agree with “engage, not enrage”. Sometimes it takes us a little to get there as parents and it may be a struggle to stop right in the midst of the milieu, but it is worth it. That is such a cute picture! Good on ya Mrs! No one ever said the parenting gig was going to be easy, who knew what we signed up for when we got pregnant. pur – things in cat in the hat land are going well although I do wonder about stars on thars (get it – remember that book?). It’s been an interesting time in my community. HH – I agree I thought the terrible 2’s were awful, then there was something else, then something else. The smaller the kid – the smaller the problem I think. On the record – LITTLE GIRLS CAN BE MEAN MEAN MEAN. Why won’t Judy Blume write for 8 year olds? PPPJ, when the dd was in grade 2, there was a “popular” girl in the class, she was very mean spirited and would tell the other children who could play with who and would deliberately leave kids out and make them feel terrible. This has continued on and it is now grade 5. I have interceded and discussed this with the teachers at the beginning of each year, because it seems this little girl always lands in my dd’s class. Things are getting better and I have given my dd tools to deal with it. You are right little girls can be mean, and if they aren’t taught differently, they just turn into mean adults and bullies. I remember the “terrible two’s” as being wonderful actually, and we really haven’t had any problems. Now we are starting the drive down the Hormone Highway. Gotta say I am not liking this drive too much, it can be so stressful and confusing to say the least. Oh ya I remember Stars on thars – wish all of the problems we faced were that easy…..
aww, I love that story, Mrs. M. Good for you. A developmental researcher I know studies something called “meta-parenting” which means thinking about parenting when you are parenting. Sort of weird to say, but this is a perfect example. Instead of going with the easy choice (punishing for having syrup hands, perhaps), you thought about what was best for him in that moment.. and ended up having a great outcome. Yeah, PPPJ, is it stars on, or stars off this week??? How anyone can keep track of the drama I’ll never know. Doesn’t it just get ridiculous? Long time no talkie. Haven’t seen you around my parts lately 😉 so I thought I would join you here. And I’m wondering if you can figure out the mystery. Anyhoo… good to see your blogging away. I started a different blog for my own personal fun. Little different than the other one to say the least. Love the engage not enrage idea. I’ve been a little too enraging this week *sigh* so it was a good reminder of what works best. I feel like 90% of the time, I remember and those other 10% are just flying by the seat of my pants. What a great perspective. No, you probably didn’t come up with a magic bullet but as you said, did gain a ‘moment’ with your son that you wouldn’t have gotten otherwise. I can really see how choosing the good was a sacrifice – I get it.